Xi's vow to cut Chinese auto tariffs, allow more competition in banking and better protect intellectual property calmed investors who have been on edge since the world's two biggest economies last week announced plans to slap tariffs on $50 billion worth of each other's products. Stock markets rallied worldwide on optimism for relief from what has become the most high-stakes trade confrontation since World War II. The Dow Jones industrial average was up more than 400 points in early afternoon trading. "This is a promising signal that there can be a path forward to address (America's) concerns without a full-on trade war emerging," said Stephen Ezell, vice president of global innovation policy at the Information Technology & Innovation Foundation, a think tank that has criticized both China's aggressive trade practices and President Donald Trump's confrontational response to them. At the same time, Ezell and other longtime China observers cautioned that Beijing has promised in the past to open its market and curb hardball tactics to acquire foreign technology without following through on those pledges. "This is positive, but we need to see action," Ezell said. Speaking at a business conference Tuesday, Xi didn't directly mention either Trump or the trade standoff with the United States. He promised progress on areas that are U.S. priorities, including opening China's banking industry and boosting imports to China. He did not, however, address some key irritants for Washington, including a requirement that foreign companies work through joint ventures that require them to give technology to potential local competitors. Last week, the Trump administration unveiled plans to impose tariffs on 1,300 Chinese products, worth about $50 billion a year in imports to the United States. It characterized those tariffs as a penalty for Beijing's forcing American companies to hand over technology to gain entry to China's market. Within hours, Beijing counterpunched with similar plans to impose tariffs on $50 billion in American products, including soybeans and small aircraft. Then, Trump ordered the U.S. trade representative to consider another $100 billion in Chinese imports to tax. David Dollar, senior fellow at the Brookings Institution, noted that the United States won't impose its tariffs until after it gives the American public weeks to comment on the plans. That leaves time for the two countries to negotiate. "You hope that reason prevails," said Dollar, a former official at the World Bank and U.S. Treasury Department. "Every time the administration talks tough, the market drops. And every time the administration says 'We're going to negotiate' the market goes back up." "The Chinese are not going to make overwhelming changes in the next 60 days," Dollar added. "But maybe the Chinese will agree to a few things, and the Trump team will be able to declare victory." Trump himself tweeted Tuesday that he was "very thankful" for Xi's comments and praised the Chinese president's "enlightenment." "We will make great progress together," Trump added. With his promises Tuesday, Xi sought to position China as a defender of free trade and cooperation despite its being the world's most-closed major economy. He hopes to contrast his softer stance with Trump's "America First" approach, which has focused on restricting imports and renegotiating trade agreements to win better terms for the United States. 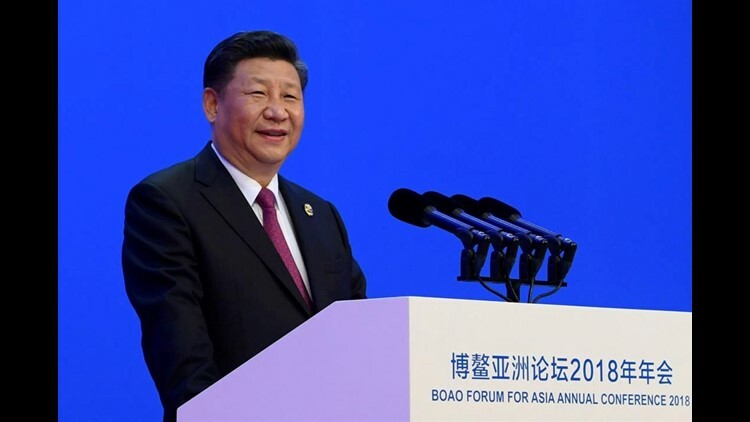 "China's door of opening up will not be closed and will only open wider," Xi said at the Boao Forum for Asia on the southern island of Hainan. Xi said Beijing will "significantly lower" tariffs on auto imports this year and ease rules that limit foreign global automakers to owning no more than 50 percent of joint ventures in China. He promised to encourage "normal technological exchange" and "protect the lawful ownership rights of foreign enterprises." Rajiv Biswas, an economist at IHS Markit, said, "This would be a victory for the world trading system and an important step away from the abyss of rising global protectionism." Skeptics pointed out that China has made promises before and then not adhered to them. The Office of the U.S. Trade Representative noted in a report in January that "China repeatedly failed to follow through" on commitments it made in U.S.-China dialogues. In 2010 and 2012, for instance, China declared that foreign companies were free to decide for themselves when to share technology with Chinese partners or other businesses. Instead, the report found, Chinese regulators "continue to require or pressure foreign companies to transfer technology as a condition for securing investment or other approvals." Also Tuesday, China filed a challenge with the World Trade Organization against Trump's earlier tariff increase on steel and aluminum in a separate dispute. Beijing, which has issued a $3 billion list of U.S. goods including pork and apples for possible retaliation, requested 60 days of consultations. If that fails, China can ask for a ruling from a WTO panel. But the stakes are higher in the dispute over China's aggressive technology policies. Chinese officials deny that they compel foreign companies to hand over technology. But business groups from outside China argue that joint venture and licensing rules make coerced transfers of technology unavoidable. Xi gave no details on how conditions might change, leaving unclear how he intends to mollify Washington. Still, Ezell said he thought Xi's speech suggests that Trump's aggressive moves might be working. Trump has "demonstrated a resoluteness, and that signals to China's leaders that we're serious."